The gaurd at the gate of Edinmire was slumped against the wall behind his post, obviously catching a few winks. The second gaurd on duty sagged in a chair, slouched over, reaching under the table directly in front of him a mere 10 feet from the sleeping gaurdswomen. He was grasping around in the dark, looking for a mirror that he had dropped. Finding it, he raised it up to gaze at his face as he had done for the past few hours. As he lifted it up to look at his sideburns, he noticed a humanoid shadowy figure one-hand vaulting the top a nearby crenellation, then nimbly drop out of sight, down to the ground. The gaurd’s head whipped around startled and seeing nothing, he stood and checked but not a single grain of dirt that littered the stones was out of place. Shrugging and returning to his mirror he didn’t notice the black hooded figure move with the waving shadows thrown by tree branches in the wind, reaching the network of alleys that crisscrossed the town. The hooded figure kept up a deadly silent but tireless pace until he saw the sign of a tavern and inn swinging in the cold night air. Riftwall Tavern. Approaching the door, the shadowy figure thumped the knocker hard three times. A black furred pawish hand letting go of the brass ring. He waited a few moments, then thumped the knocker again far more urgently. After a moment more, a female snowleopard in a cute night gown that reached down to her heels and a night cap with a purple tuff on it, answered. The door opening slightly. Clearly cautious of such a shady looking character arriving at such an hour. The character pulled back his hood revealing a lean face without an expression. A simple and kind smile formed on the face, before the character spoke in a thick russian accent. “I’im luuking forr a ruum tew sleip ihn untiel mourning. Iz won availible?” The snow leopard looked slightly confused by his accent but then registered what he said and replied “Of course, come on in. Have a seat while I get you a key. You must be thirsty from your journey, I’ll go wake my waitress.” The leopard passed the door’s weight to her guest and walked up some stairs, the stranger walking through the door and letting it close behind him with a whumph. Adira came down carrying a key, a drink of alcohol and a small piece of meat. (having found that she couldn’t wake her daughter) The character who had interrupted her night sleep appeared to have a strange form for a wolf kadrien, even without his blood red eyes. She had never seen any race of wolf keidrian like him. Her guest had taken a seat at a table in the corner to the right of the door he had come in. The leopard looked at him and was surprised to see that he wasn’t wearing anything under his cloak. His only other adornments were red stains on his fur, and several piercings on his ears and chin. She noticed that he also had a massive five claw paw swipe scar across his right calf. Something about this wolf seemed dangerous. The look in his eyes sent a shiver went down her spine and to the tip of her tail. It was the look of a rabid feral keidrian before it attacked. But at the same time, there was a discipline and a strained restraint. She found herself looking at him as she walked towards his table. 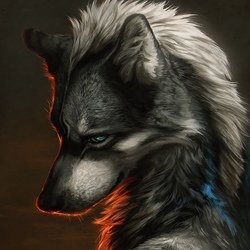 The wolf locked eyes with her and a sudden and terrifying image materialized in her head, an image of him leaving what seemed to be a bar fight, but something was vastly different from any bar fight she had witnessed. There were bodies everywhere. No. No. She didn’t want to know where that image had come from or what it meant. She shook her head to rid herself of the image. Her only job now was to get him a room and a drink. She set down the drink on the table with a small piece of raw venison and said “Here’s something to go with the drink.” The stranger didn’t say a word, he just scoffed the meat at once and picked up the tankard, clearly intending to chug it. “Slow down, that’s quite str...” The stranger had finished the tankard and set it down on the table. Wiping his face with the back of his hand. Still having never made a noise despite having eaten extremely quickly. Adira was about to hand him the key to his room with a shaky hand, when another heavy knock thumped from the front door of the Tavern. Meanwhile Maeve has been faking being asleep to avoid work but the whif of fear she caught rolling off her mommy made her get up and creep to the top of the stairwell, and peek around the corner tentitively to see what was going on. She saw her mommy shake her head and then locked eyes with the strangers blood red eyes. Just a knock reverberates from the front knocker.